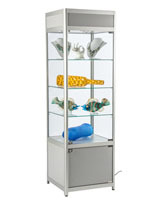 Portable display cases provide an eye catching approach to present products while at trade shows. Adding classic and sleek showcases to your repertoire of expo fixtures will provide a professional approach for merchandising. 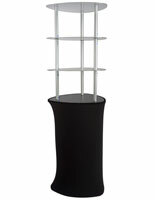 Are you looking for a floor standing product holder that is both functional, as well as attractive? This category has compiled an assortment of cabinets that are sure to please your merchandising desires. The cases are well-lit, contain locking doors, include a carrying container with purchase, and provide enclosed storage areas. 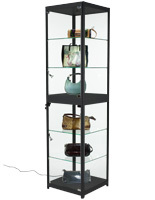 The display cases can be utilized for a large variety of products. Portable display vitrines are great for presenting jewelry, Apple iPad series products, cell phones, or an assortment of fragrances just to name a few. Are you looking to captivate an audience and peak their interest with aluminum portable display cases? Draw passerby’s attention with a custom and sophisticated showcase that is made of tempered glass. Not only are products made noticeable with the interior spotlights, the streamlined aluminum framing provides an understated trimming. Portable display vitrines are ideal for trade show exhibits due to the quick assembly time and transportability with each rolling storage container. 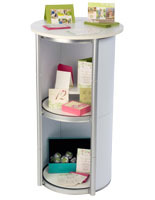 The cases are high quality presentation equipment stands. 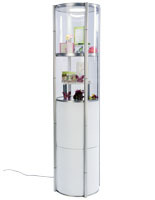 What are the major features that make a vitrine ideal for trade shows? Trade show exhibits require fixtures that are constructed and dismantled rapidly, making portable display cases effective exhibit furniture. Most units' assembly requires two participants and can be completed in minutes! 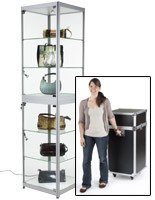 The hassle of figuring out how to store and transport a large glass showcase is removed with the transportable casing that is included with purchase. Not only will the entire unit be moved with ease, it will also be protected while in transit and stored neatly when not in use. Locking glass doors provide security and convenience to openly present high quality, expensive, delicate, or collectible items without worry. Protected from being tampered, damaged, or stolen these units are ideal for fast paced and high traffic settings like trade shows. 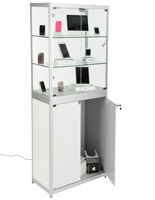 Portable display cases, also known as movable vitrines, provide a means for elevating merchandise in a safe and effective manner. Containing merchandise in a locking exhibit offers one focal point for customers to browse. 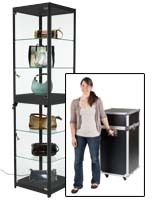 Display series units provide a means for presenting products with ease and in a customizable manner. As standalone fixtures, they provide visibility from all four sides. The locking movable vitrines for trade show use is available in multiple configurations, styles, sizes, and colors within this category. To create a dynamic and individualized arrangement that is also cohesive, combine various cabinets together for one harmonious expo exhibit. By mixing half view and full view cases, different finishes, or diverse sizes your trade show booth will deliver a compelling impact. What are some items that could easily utilize vitrine showcases? Rather than using a low level countertop jewelry case, these elevated aluminum framed cabinets bring jewelry items up to the customer’s eye level. Rings, necklaces, earring sets, bracelets, watches, pendants, and brooches can all be placed on exhibit within these locking merchandising fixtures. Multiple shelves provide a staggered approach to featuring beauty products. A unique advertisement composition can be arranged with items such as lotions, perfumes, cosmetics, cologne, hair accessories and beauty tools. Keeping high priced items like electronics behind locking doors provides a sense of ease when in a heavily crowded environment. For example, iPad series, cell phones, tablets, cameras, navigation devises, laptops, headphones and speakers, or mobile MP3 players are easily elevated and tucked away. Securely enclose all merchandise within the unit for safety and security while at a busy trade show. Fashion accessories, like hand bags, wallets, scarves, sunglasses, belts, and wristlets, are highlighted with the LED lights creating an expensive looking and welcoming exhibit. The glass sides allow clients to view the items, but must ask permission to physically touch the valuable products. 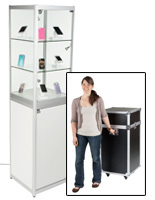 Affordable movable vitrines provide a unit that is easily transported to and from trade shows. The functionality and aesthetically pleasing designs of these cases provides a merchandising tool any expo connoisseur should add to their fixtures repertoire. This category includes both full view, and half view cabinets. 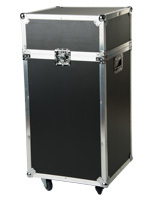 By incorporating a half view case into your inventory, additional storage can be utilized at events with limited space such as a show booth with the provided locking base cabinet. Mobile carrying containers are included with purchase for most of the stands within this category. 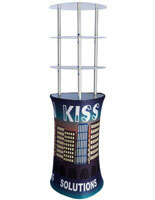 This trade show exhibit category is only one of the many specialty items offered through Displays2go. The online catalog offers a large variety of movable truss systems, expo booths, banners, prize wheels, and additional exhibit accessories to name a few. In addition, be sure to browse the extensive selection of inventive, attractive, and functional marketing items available. If an order is placed (Monday - Friday) before 1:00 PM EST typically it will be shipped the same day when in stock. Orders can be placed online or by calling customer service at 1-800-572-2194 Monday - Thursday 8:00 AM - 6:30 PM EST and Fridays 8:00 AM - 5:00 PM EST.